My name’s Yan Sim and I have the privilege today of speaking on behalf of the Graduating Class of 2014. I’d like to start by first, welcoming our loved ones who have come from near and far to celebrate this moment we’ve been working towards for the past four years. To our proud friends and families, you’ve had the opportunity to see us change and grow during our time here at Queen’s. I think I speak for us all in saying, we wouldn’t be here without you. Your support pushed us to be the physicians we are today as we trained, acquired knowledge and searched for answers. More specifically, the answers to your sometimes very personal medical questions. Questions ranging from “Will cracking my knuckles give me arthritis?” to “What’s that on my leg?” and “why does this hurt when I do that?” After four years of training I think I can say with confidence: “No”, “I don’t know”, and “Please not at dinner”. All jokes aside – please be assured of our sincere gratitude. As we sit here today, a class representing the most successful residency match in the history of Queen’s medicine, we couldn’t have done so without the care of our beloved faculty and staff. I can’t think of many medical school deans who would attempt to host dinners at his home to feed a hundred starving first year med students and yet you did, Dr. Reznick, even providing tupperware to take the leftovers home. And to Dr. Sanfilippo, Dr. Winthrop, Dr. Moffatt and our many teachers, thank you for your inspired teaching and for continuously involving us in shaping the medical curriculum. Thank you for believing in us, for being our role models, and for always pointing us upward as we have now ascended to the very bottom of the totem pole that will be residency. It has been a memorable four years at Queen’s. There’s a uniqueness about the place and it’s not just the grandeur of the ivy and limestone buildings, but built from the heart of a tight-knit community raising friendships that will continue to stand even after the ivy has faded away. To my classmates, thank you for the honour of speaking on your behalf today. More importantly, thank you for the last four years as we’ve walked this journey of medicine from being just classmates to colleagues to friends, and now even family. No words can express my deep affection for each and every one of you. Almost on a daily basis, I have been overwhelmed with the support you’ve shown me to pick me up when I’ve fallen down, the laughs that have kept me smiling and the love that has kept me growing up. I hope the words I speak today resonate with you as well. Since our first day at Queen’s, we’ve always been a class that has been a little unconventional. It’s been documented on more than one occasion how we love to have fun. However, I think that being the “fun class” masked how seriously and earnestly we took our studies. As a class, we seemed to push boundaries in all areas of medicine and life, much to the delight and frustration of our faculty. And even throughout the last couple years, as our lives transitioned from the lecture hall to the hospital ward, we’ve continually stretched the limits, striving for perfection as evidenced by our many successes in research, academics and even extending far beyond the field of medicine. And while we’ve had some edges that needed smoothing and corners that needed rounding, I believe that these successes stem from a passion for life, for medicine and for our future patients. A dissatisfaction, if you will, with the status quo. It is an ambition that is birthed from asking the seemingly simple and yet difficult questions – “What more can I do for my patient? What am I doing to better the lives of those around me?” These are the questions that not only shape who we choose to be, but also, define the contributions we are going to make. And it’s so easy, to let these deep and introspective questions that we’ve asked of ourselves slip away into the busyness of everyday life. As we get older, the years seem to move faster, the demands on our time grow greater and the noise from the waiting room gets louder. In attempt to fight the fatigue, we mistakenly substitute lives of significant contribution and meaning for a busy routine. We replace the difficult and vast questions with smaller, more manageable, questions. Prominent physician activist, Dr. Samantha Nutt, said questions like “What am I going to do with my life?” quickly evolves into “should I rent or buy?”, which lives next door to “how can I get a bigger house in a better neighbourhood?”, and coincides with “should we have two cars?”, “is this a good time to renovate the bathroom?” and “is this wall big enough for a flat screen TV?” and before you know it…” the defining questions that once gave us a passion to attain this year’s grand accomplishments have been replaced with next year’s daily grind. 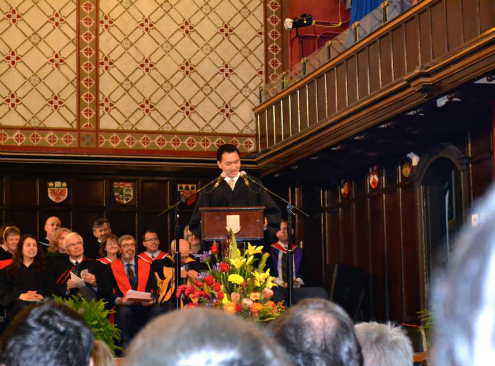 And yes, we’ve come a long way and should be proud of our accomplishments as medical graduates of Queen’s University. In the days and years to come, we will be tempted to drown out the big questions with the noise of our busy lives. Sir William Osler said that “To have striven, to have made the effort, to have been true to certain ideals – this alone is worth the struggle.”My hope is we remember the questions we have asked of ourselves here at Queen’s and to dare to ask bigger questions. Whether we search for these in answers in our life’s work, our family, our friends or our faith, let us stay as hungry to make a difference as we were four years ago. And I know we’ll make that difference in the years to come. Fang, Sin-yang Harry, and Lawrence Jeffery. Rehabilitation: A Life’s Work. Hong Kong: Hong Kong UP, 2002. Print. One thought on "“Try to leave the world just a little bit better…”"
What a wonderful speech! Thank you for sharing Dr. Sanfilippo. Next PostNext Medical Council of Canada (MCC) Clinical Presentations: How are they used in our curriculum?